Block Island wind farm with five turbines shown in grid area at the three mile limit line off the southeast side of the Island. A lot has gone on this year that has and will continue to impact our bays and ocean waters and the health of our fishery. Here are four major issues that I thought and wrote about a lot this year. Narragansett Bay and near coastal water temperatures have been heating up for nearly forty years. How warm you ask? Well it used to be very cold. The crew of the Brenton Reef lightship measured water temperature at the mouth of Narragansett Bay every day from July 1878 through January 1942. In the coldest winter recorded (1917-18) the water temperature from December through February was 33.2 F. The average for the whole period of their record (64 years) is much warmer at 39.1 F. (Nixon, Granger and Buckley, The Warming of Narragansett Bay, 2003). However, even this temperature of 39.1 F is far from the warmer water temperatures recorded this February 12, 2012… Conimicut Point, 45 F; Newport, 42 F; and Block Island, 46 F.
Obstacle after obstacle have been put in front of scientists, ocean spatial planners (like zoning in your town accept in the ocean) and wind energy developers. Two companies, Deapwater Wind (in RI) and Cape Wind (in MA) have been working with local fisherman, spatial ocean planners and government officials to site wind farms in our oceans. They have made great progress this year thanks to helpful federal policy and local government officials taking the bull by the horns and pushing this initiative forward. Developers are developing wind farms responsibly. The Bureau of Ocean Energy Management (BOEM) and agencies like RI Coastal Resources Management Council, that has developed a model for spatial planning used by others throughout the US, are working with developers of wind farms to locate and mitigate the impact of wind farms on the environment and fisheries. It looks like our five turbine wind farm off Block Island will start construction in 2014. The wind farm will generate over 125,000 megawatt hours annually, supplying the majority of Block Island’s electricity needs. Excess power will be exported to the mainland via the bi-directional Block Island Transmission System. Learnings from this project will be applied to the 200 plus wind turbine farm planned for the Cox’s Ledge area off Rhode Island. We have a lot of work to do to make sure these wind farms and others are developed responsibly but we are making great progress and we are on the right path. The ruling supports the catch share fisheries management approach engaged by fish managers in New England. This was the third time the courts ruled in favor of catch shares. Government officials, fish regulators and mangers in RI and MA need to stay the course and not be distracted by vocal minorities in the fishing community that provide very little in the way of positive (proven) solutions to fishing challenges. Another example of a successful sector management program is the RI Fluke Sector Pilot which ran for three years. It was put on hold this year not because it failed, but many say because local political leaders and regulators believed it was political expedient to do so. It is wrong to play politics with fish as Massachusetts leaders did with ground fish and as we are doing with the RI Fluke Sector Pilot. In both the RI Fluke Sector and the New England Ground fish case, annual catch limits were put into place to prevent overfishing and to rebuild stocks. The idea was to provide fishermen with two options for controlling fishing effort. Fishermen could either form groups and fish an allocated share of the total allowed catch or fish individually with a limit on the number of days spent fishing. Fishing in groups with a total allowable catch (TAC) offers fishermen flexibility to fish when market prices are highest, fish for species when they are available and other species are not or when the weather is good. Among the trends, were increased revenues and prices. The sector proved to be a very effective way to sustain the resource with record low discard rates (as much as 98% fewer discards than non sector participants). According to a paper presented by Dr. Chris Anderson, a former professor of environmental and natural resource economics at the University of Rhode Island, "...the (RI Pilot) sector shifted fluke landings to times when they could maximize price. Comparing revenues… we find the sector program increased fleet wide (twelve boats in the fleet at this time) revenues over $800,000, including benefits of over $250,000 to non-sector vessels.” So the pilot sector enhanced revenue for its twelve members, but also incurred enhanced revenue for non-sector vessels. Our State and US Congressional delegations and fish mangers should continue to learn from the RI Fluke Sector Pilot and New England Ground Fish sector because they worked and have been successful. While listening to one small vocal segment of the fishing community, some Massachusetts (and Rhode Island) fish mangers and elected officials were convinced that “catch shares” management models were bad. These two programs have proved them wrong. Government leaders and fish managers need to follow the court’s lead, stop playing politics with the fish and keep sector management rolling in Rhode Island and New England. On December 14, 2012 the Atlantic States Marine Fisheries Commission (ASMFC) voted on Draft Amendment 2 to the Interstate Fishery Management Plan for Atlantic Menhaden which outlined a number of new regulations on the species. This was a major vote and the first time in that such restrictions have been put on the harvesting of this important t fish. Peter Baker of the PEW Environment Group said “… the ASMFC listened to the science and the public in taking a historic step to end overfishing of Atlantic Menhaden and to begin to rebuild the population of this important little fish… By adopting the first coastwise catch limit on this fishery, the commission has begun to reverse the 90 percent plunge in the menhaden population over the past three decades. Sound science clearly calls for leaving more of these fish in the water to fulfill their ecological role. 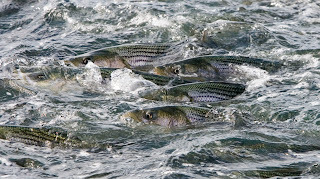 More menhaden means more food for ocean wildlife, from seabirds to whales and popular game fish such as striped bass.”. A new total allowable catch (TAC) limit along with regulations to achieve it will help ensure that the Atlantic Menhaden biomass rebuilds and stays at desired sustainable levels. In addition to being a great food source for other fish, Atlantic Menhaden also serve as roving filters, converting algae into energy and thus reducing nutrient loads in bays and covers. A reduction of nutrients means fewer algae blooms and ultimately more oxygen for all fish. The ASMFC vote on Atlantic Menhaden was a big win for the fish and the environment in Rhode Island and along the east coast. Many in the recreational fishing community in Rhode Island were disappointed at the 20% reduction approved by the ASMFC. Don Smith, representing the Rhode Island Salt Water Association said, “We were advocating for a 30% reduction and could not understand why the Rhode Island delegation was settling for less." 1. It resulted in the adoption of a first-ever coastwide quota (total allowable catch, or TAC) for menhaden, reflecting the ASMFC’s commitment to end overfishing and achieve long-term protection and sustainability for this ecologically important species, and the people who depend on it. 2. It resulted in a new coastwide quota set at 80% of the average coastwide landings of menhaden over the three-year period 2008-2011 – i.e., 80% of 470 million pounds = 376 million pounds. 3. It resulted in a state-based allocation program, which allocates the new coastwide quota according to the average percentage of each state’s landings over the three-year period 2008-2011. A bucket of fish for research: a bucket of tautog caught for research on the charter vessel L’il Toot. Capt. John Rainone took a family (with children) from the Narragansett Recreation Department’s assistance program fishing along with town officials and State DEM researchers. This past Friday the Atlantic States Marine Fisheries Commission (ASMFC) voted on Draft Amendment 2 to the Interstate Fishery Management Plan for Atlantic Menhaden which outlined a number of new regulations on the species. The ASMFC is comprised of representatives from fifteen coastal states. “Today the Atlantic States Marine Fisheries Commission listened to the science and the public in taking a historic step to end overfishing of Atlantic Menhaden and to begin to rebuild the population of this important little fish.” said Peter Baker of the PEW Environment Group. “By adopting the first coastwise catch limit on this fishery, the commission has begun to reverse the 90 percent plunge in the menhaden population over the past three decades. Sound science clearly calls for leaving more of these fish in the water to fulfill their ecological role. More menhaden means more food for ocean wildlife, from seabirds to whales and popular game fish such as striped bass.” said Baker. A new total allowable catch (TAC) limit along with regulations to achieve it will help ensure that the Atlantic Menhaden biomass rebuilds and stays at desired sustainable levels. 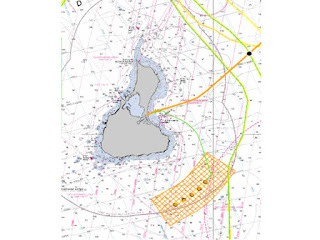 The approved Amendment establishes a 170,800 metric ton (MT) total allowable catch (TAC) beginning in 2013 and continuing until completion of, and Board action on, the next benchmark stock assessment, scheduled for 2014. The TAC represents a 25% reduction from 2011 levels and a 20% reduction from the average of landings from 2009-2011. The ASMFC board had also adopted new biological reference points for biomass based on maximum spawning potential (MSP), with the goal of increasing abundance, spawning stock biomass, and menhaden availability as a forage species. “Through the selection of the MSP-based reference points, beginning with adoption of Addendum V in 2011 and continuing today, the Board has made a conscious decision to address the ecosystem services provided by Atlantic menhaden,” stated ASMFC Board Chair Louis Daniel of North Carolina. “Given the stock is experiencing overfishing and is most likely overfished based on the newly adopted reference points, it was incumbent upon the Board to reduce landings in order to ensure the long-term sustainability of the resource and the fisheries that depend on it.” said Daniel. The new overfished and threshold definitions were accompanied by a number of regulations to help achieve desired levels. Atlantic Menhaden are harvested for use in fertilizers, pet food, cosmetics and for use in fish protein pills. One company, Omega Protein, is historically responsible for harvesting about 80% of all Atlantic Menhaden. 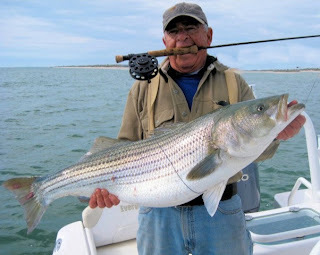 Commercial bait fishers also harvest Atlantic Menhaden for use as bait in lobster pots and for use by recreational anglers as bait to catch game fish such as striped bass. Widespread participation from both sides of the issue… industry processors and recreational anglers/environmentalists weighed in with the ASMFC and put pressure on legislators and representatives from states that are ASMFC members. Each state is represented by three commissioners: the director for the state’s marine fisheries management agency, a state legislator, and an individual appointed by the governor. Rhode Island commission representatives include Mark Gibson and Robert Ballou (both from RI DEM) and Representative Peter Martin (Capt. Rick Bellavance, president of the RI Party & Charter Boat Association, is a RI Legislative proxy). Comments from them on ASMFC proceedings will be covered in next week’s column. Menhaden are an oily fish and a favorite meal for sharks, whales, striped bass and other game fish targeted by recreational anglers. They are an important part of the food chain. Atlantic Menhaden also serve as roving filters, converting algae into energy and thus reducing nutrient loads in bays and covers. An adult menhaden is able to process up to 4 gallons of water per minute or a million gallons of water every 180 days. Multiply this by the number of menhaden in any given area and this is an amazing amount of water being filtered, a reduction of nutrients means fewer algae blooms and ultimately more oxygen for all fish. The Amendment allocates the TAC on a state-by-state basis based on landings history of the fishery from 2009-2011; allocation will be revisited three years after implementation. Further, it reduces the Chesapeake Bay reduction fishery harvest cap by 20% (this is an adjustment of cap which was in place since 2006). States will be required to close their fisheries when the state-specific portion of the TAC has been reached; any overages must be paid back the following year. The Amendment includes provisions to allow for the transfer of quota between states (which may be particularly important for Rhode Island and Massachusetts as historically most of the Atlantic Menhaden caught in RI is landed in MA). A by catch allowance of 6,000 pounds was approved for non-directed fisheries that are operating after a state TAC has been landed. The Amendment also establishes requirements for timely reporting and improved biological monitoring. The Department of Environmental Management, in conjunction with the RI Party and Charter Boat Association and the Narragansett Department of Parks and Recreation, helped turn a recent scientific fish monitoring survey into a recreational fishing experience for a family in need. Working with principal marine biologist Jason McNamee of DEM’s Division of Fish and Wildlife, John Rainone of the RI Party and Charter Boat Association, and Steven Wright and Tom Tessitore of the Narragansett Department of Parks and Recreation, a tautog collection survey took place on the morning after Thanksgiving. 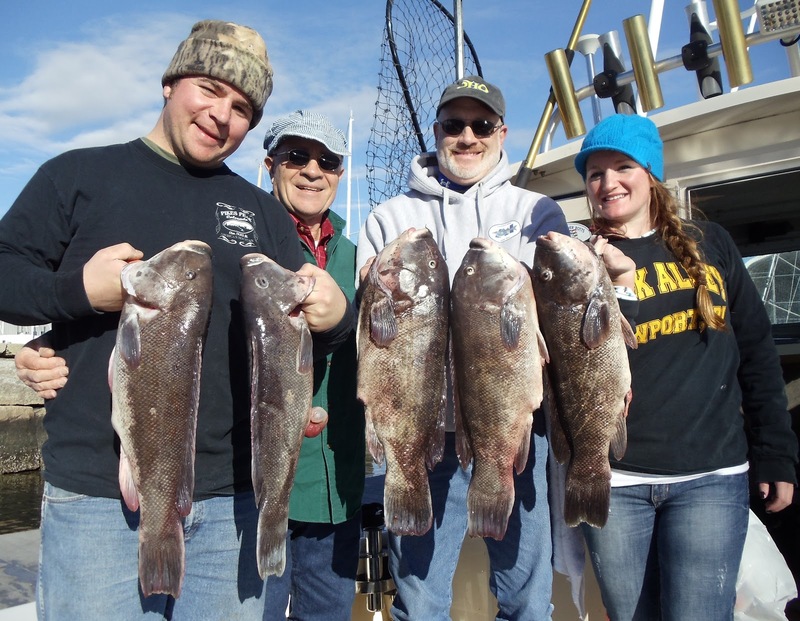 A family from the Narragansett Parks and Recreation assistance program was chosen to participate in a free tautog fishing trip aboard Captain John Rainone’s L’il Toot charter boat. While the family had an opportunity to enjoy a fun day of recreational fishing for tautog, they also helped collect 31 fish ranging from 10-22 inches in length for DEM’s monitoring program. Nicole Travisono, a principal biologist in DEM’s Division of Fish and Wildlife, was onboard the vessel to coordinate the scientific collection. “Sometimes hard work is a lot of fun. In addition to the scientific benefits, the collaboration provided this Narragansett family – a father and two boys, aged seven and nine – an opportunity to take part in a fun-filled day of fishing on a charter vessel and to bring home some freshly-caught fish,” said DEM Director Janet Coit. “While they were out in the state’s waters, they also saw dolphins – another highlight of their fishing trip! And, I bet this special project deepened their appreciation for the variety of marine life in our seas. All in all, the effort provided a boost to our science and a good day all around.” said Coit. Atlantic Menhaden (Brevoortia tyrannus). Photo by Brian Gratwicke. I have written about Atlantic Menhaden and the role they play in our fishery in Narragansett Bay and in the ocean a number of times. Atlantic Menhaden serve as roving filters, converting algae into energy and thus reducing nutrient loads in bays and covers. An adult menhaden, through its unique filtering gills, is able to process up to 4 gallons of water per minute or a million gallons of water every 180 days. Multiply this by the number of menhaden in any given area and this is an amazing amount of water being filtered, a reduction of nutrients means fewer algae blooms and ultimately more oxygen for all fish. This week the Atlantic States Marine Fisheries Commission (ASMFC) which is comprised of representatives from fifteen coastal states will vote on Draft Amendment 2 to the Interstate Fishery Management Plan for Atlantic Menhaden which outlines a number of possible regulations on the species. These proposed regulations will force the Commission to choose between allowing industrial processors to continue to overfish the species with little or no restrictions or will rescue the fish with regulations that will start to rebuild the species that can help restore our bays, coastal waters and fishery. 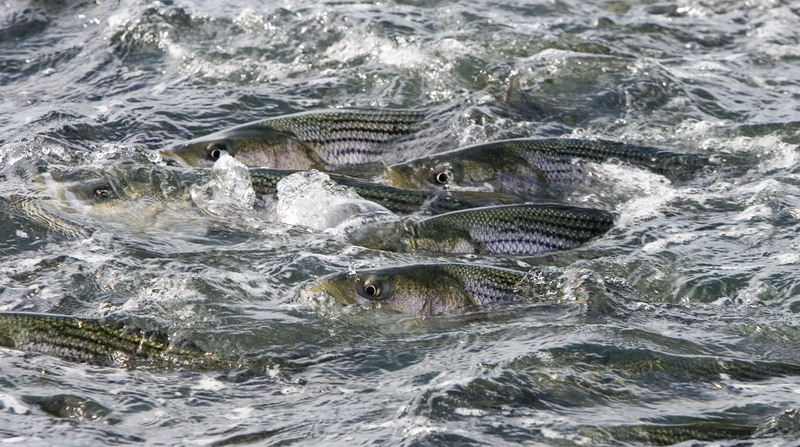 Amendment 2 Atlantic Menhaden regulation issues will come before the Commission this Thursday. We will report on outcomes in next week’s column. The West Bay Anglers are continuing to hold their Lobster Raffles throughout the fall and winter to raise funds for the Impossible Dream and their RI Take a Kid Fishing program. They occur each Saturday at the Warwick FOP, 95 Tanner Avenue, Warwick, RI from November 3, 2012 through March 16, 2013. Doors open at 1:00 p.m. and the public is invited to attend. Yes they raffle off lobsters… not ordinary lobsters… but large lobsters ranging from six to fourteen pounds. They also usually have a raffle table with small appliances like toasters and George Forman Grilles, a meat table with hams and roasts of all types, a miscellaneous table, and a final raffle table with large prizes like Sony flat screen TVs, GPS systems, gift cards, cash and much more. For information call 401.463.7532. Last week the Marine Fisheries Division of the RI Department of Environmental Management announced the winter harvest schedules for shellfish in management and transplant areas. They include the following. also includes a portion of Eastern Greenwich Bay (GB Sub-Area 3). Refer to http://www.dem.ri.gov/maps/mapfile/shellfsh.pdf for detailed closure information. GB Sub-Areas 1 and 2: Open from January 1, 2013 through April 30, 2013 between 8 AM to 12 noon on Mondays, Wednesdays, and Fridays. sunrise to 12 noon. Note: The Bissel / Fox Shellfish Management is closed to oyster harvest. Mill Gut Shellfish management area harvest schedule: Open from December 12, 2012 through April 30, 2013 between 8 AM to 12 noon on Mondays, Wednesdays, and Fridays. A first for New England: Capt. Al Anderson (left), skipper of the Galilee based charter boat Prowler, is inducted into the International Game Fish Association’s (IGFA) Hall of Fame for his fish tagging conservation efforts. Rob Kramer, IGFA president with Al at the induction ceremony. 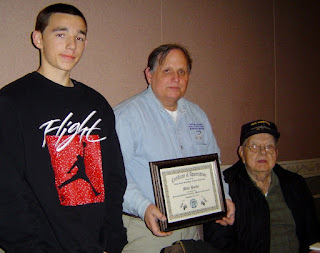 Three generations: Mike Bucko (center), owner of Bucko’s Tackle Service, Fall River, spoke last week on reel maintenance and repair at a Rhode Island Saltwater Anglers Association seminar. Mike Bucko flanked by his son and father (both named Joe) have been in business since 1978. Al Anderson, captain of the Galilee based charter boat Prowler, was inducted into the International Game Fish Association’s (IGFA) World Fishing Hall of Fame for his career tagging of nearly 60,000 game fish for science, along with his work as an author. 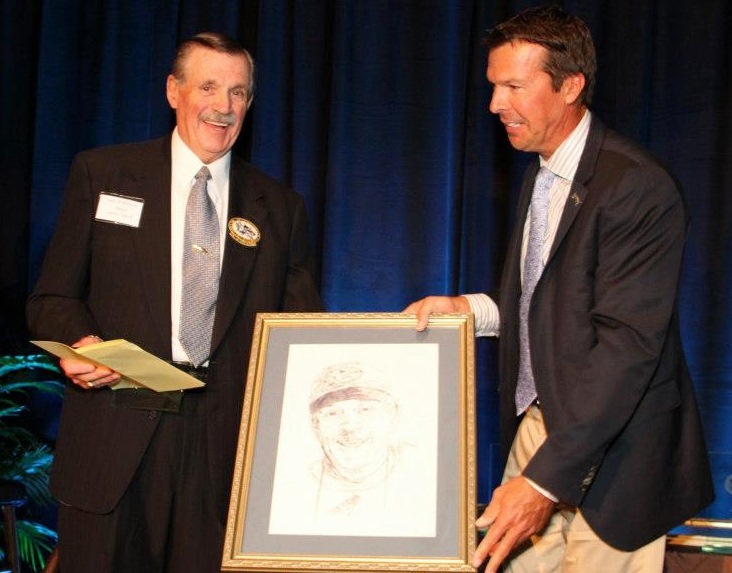 He is the first New England charter captain ever to be so honored by the IGFA. 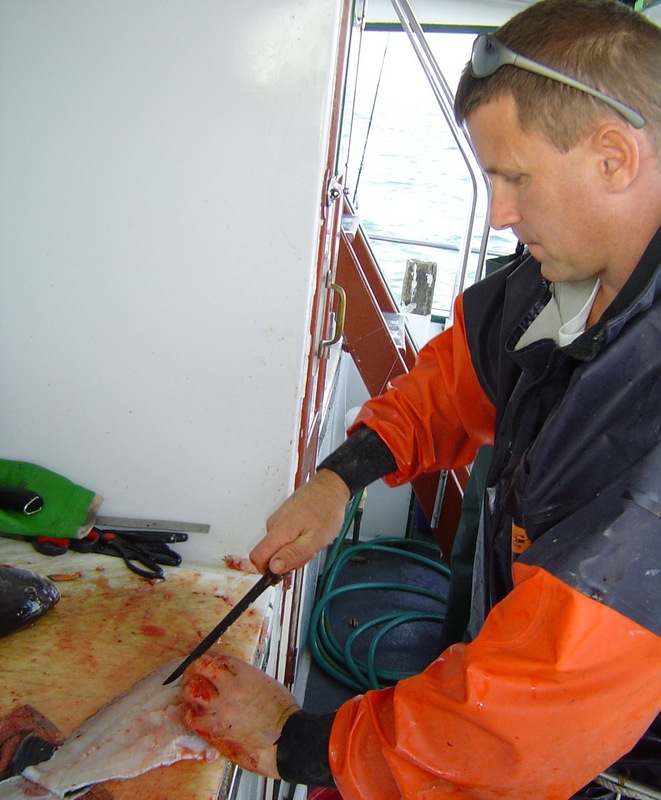 Anderson became a USCG Licensed charter captain in 1967, and credits his clients who supported his “conservation for science” ethic by assisting with his fish tagging activities. Anderson has won five conservation awards for this tagging of bluefin tuna, striped bass and other species. 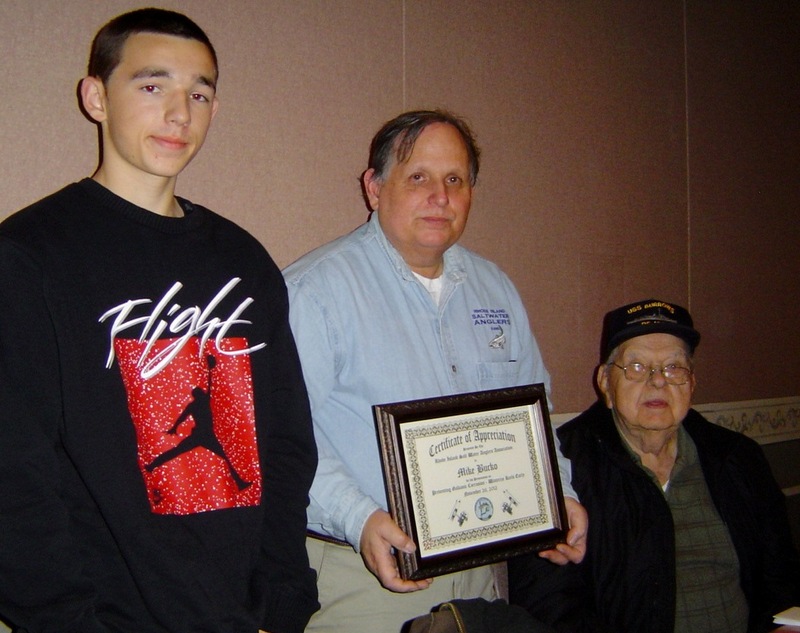 In 2010 he received the American Littoral Society (ALS) Conservation Award for 2,200 plus reported striped bass tag recaptures. In 1987 he was a founding member of the RI Marine Sportfishing Alliance and serves on the board of a number of sport fishing clubs, associations and tournament committees. Congratulations to Capt. Al Anderson, a Rhode Island sport fishing legend! Speaking at a Rhode Island Saltwater Anglers Association (RISAA) seminar last week, Mike Bucko explained the science of galvanic corrosion and what anglers need to do to prevent it. Bucko, his son and father (both named Joe) have been in business for 34 years serving anglers across the country providing them with service and an extensive parts inventory. The company totally dismantles reels, puts all parts through an extensive cleaning process and then reassembles the reels for use. Visit them at www.buckoparts.com. Rhode Island has two ocean windmill projects off its shores in the development phase and both are being spearheaded by developer Deepwater Wind. The first project is the five turbine Block Island Wind Farm and Transmission System project and the second is off both Rhode Island and Massachusetts shores which has been designated as an area of mutual interest (AMI) between the states. Rick Bellavance, liaison between Deepwater Wind and the fishing community, said, “The Block Island project had its second fishing community information meeting this Tuesday on Block Island for those in the fishing community that might not have been able to make the first meeting held in Narragansett in October.” Those attending learned about the fisheries data that has been collected and what research is proposed as the project moves forward. Bellavance said, “The fishing community hopes to be able to negotiate with Deepwater Wind directly to talk about mitigation from two perspectives. First how it directly impacts those that have history fished in the area the wind turbines will be located in, and secondly how the wind project will impact the fishing community as a whole.” For further information, contact independent fisheries consultant Rick Bellavance at 401.741.5648 or www.biwffisheries@gmail.com . November 30: BOEM announces the renewable energy ocean lease sales for wind farms. 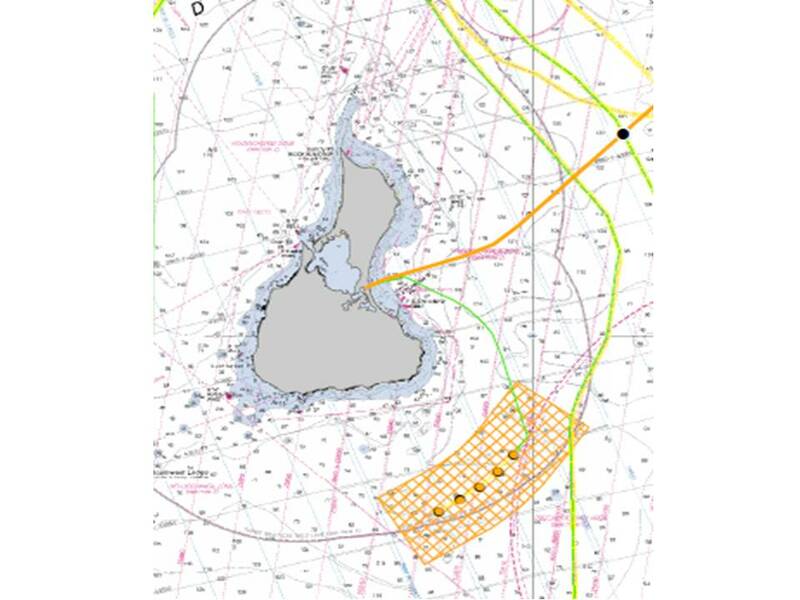 The proposed sale notices offer 277,550 acres in two "Wind Energy Areas" - one area offshore Virginia and the other area of mutual interest offshore Massachusetts and Rhode Island which is the area of the 200 plus wind turbine project Deepwater Wind has expressed interest in. December 31: Army Corps of Engineers has extended is comment period on the Deepwater Wind project until December 31, 2012. The original public notice for the project and project details can be found on the US Army Corps of Engineers website at www.nae.usace.army.mil. Anyone wishing to comment should submit them in writing by December 31, 2012 or call Michael Elliott at 978.318.8131 with questions. January 15: the Coastal Resources Management Council (CRMC) of RI is soliciting public comment on Deepwater Wind’s Block Island project. Plans for the project can be seen at the CRMC office in Wakefield, RI. Deepwater Wind has made the Environmental Report they submitted with their CRMC application available on their website at www.dwwind.com. A hearing on the project may be requested by submitting an objection in writing to the RI CRMC at their 4808 Tower Hill Road, Wakefield address. Note: all objectors must attend the hearing once it is scheduled and give sworn testimony. Hearing requests must be received by CRMC by January 15, 2013. Traffic jam at Montauk: Sport fishing photographer Jim Levison captured this photo during the fall striped bass run off Montauk. Jim’s prints make a great holiday gift for anglers and can be seen and purchased on his website at www.jimlevisonphoto.com . Fresh or saltwater fly tying is great fun: Jim Mancini of East Greenwich, RI works on his peanut bunker fly at a United Fly Tyers of RI meeting. Membership for a year is $30 which includes all supplies for ten fly tying meetings. This is a great holiday gift. Wondering what to get your favorite recreational angler for the holidays? Here are some holiday gift ideas. Gift certificates at your local bait & tackle shop, Benny’s and stores like the Bass Pro Shop are always good too. On the Water and Saltwater Sportsman magazines, $18 to $25. Saltwater Sportsman is about $18 (cost varies with special offers) for ten issues and On the Water costs about $25 for printed or digital versions for an annual subscription. They are my favorite saltwater fishing magazines. Both magazines feature many how-to articles, regular features on fishing gear, tackle, fishing tactics and On the Water has weekly online local fishing reports. Visit www.onthewater.com or www.saltwatersportsman.com to purchase a gift subscription. United Fly Tyers of Rhode Island (UFTRI) annual membership dues, $30. If you know a fly fisherman, fresh or salt water, they will appreciate this gift. 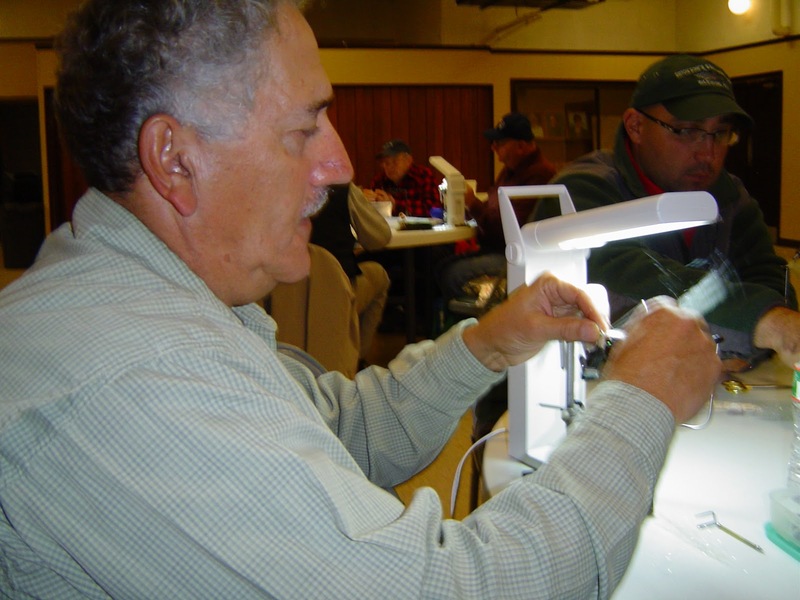 Members meet in workshop form and learn how to tie one of five to six different flies each month. Beginners welcome. Meetings held the first Wednesday of every month at the Knights of Columbus Hall in Warwick, RI. Visit www.uftri.org . The Striped Bass 60++ Pound Club, about $21 for the paperback by Tony Checko at www.barnesandnoble.com . Both this book and the author’s 2008 version focus on striped bass of 60 pounds or more. The book includes the story of Peter Vican and his first record Rhode Island striped bass of 76 lbs. 14 oz. Fishing lures $3 to $20. I’d like to mention three types that interest anglers… surface lures (often referred to as poppers) that stay on top of the water splashing. Second, swimming lures that swim through the water and third, soft plastic baits of all types... all three are used for fresh and saltwater fishing. Fish scales to weigh an angler’s catch, $10 to $50. Combination fish gripper/scale is about $50. Conventional scales range from $10 to $25, and digital fish scales about $50. Can purchase them at Benny’s, West Marine and local bait & tackle shops. Membership in the Rhode Island Saltwater Anglers Association (RISAA), $50. One of the best organizations I have ever belonged to. This association is created by and for recreational saltwater anglers and the monthly seminars and education programs on fishing techniques and how to improve catches are great. The Association supports marine conservation and fisheries resource management. Visit on-line at www.risaa.org . Saltwater Sportsman’s national fishing seminar series with host George Poveromo, $55. This year, one of the six sessions (the Saturday, February 2 session) is being held at Rhode Island College in Providence. The series is hosted by George Poveromo of George Poveromo’s World of Saltwater Fishing television program and editor-at-large for Salt Water Sportsman magazine. Two of the local Captains at this session are Capt. Andy Dangelo of Maridee Charters and yours truly, Capt. 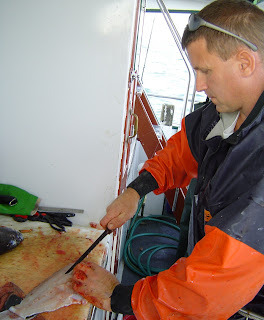 Dave Monti of No Fluke Charters. The Saturday sessions are held from 9 a.m. to 4 p.m. Cost for six hours of fishing instruction by national and local captains, guides and George is $55. This includes the seminar, a year subscription or extension to Salt Water Sportsman magazine, goodie bag, door prizes and more. Register at www.nationalseminarseries.com. Museum quality striped bass photo prints ($99) by noted sport fishing photographer Jim Levison. These beautiful fall run photos taken off of Montauk can be seen on Jim’s website at www.jimlevisonphoto.com (click Montauk). Prints are available from 11'” x 14” to 2 feet by 4 feet. Prints start at $99 for an unframed 11” x 14” glossy finish ($299 framed). General fishing or learn how to fish charters, $350 to $600 (depending on number of people, species targeted, boat size, etc.) for a half day. Hire a charter to help teach adults or children how to fish or to take experienced anglers fishing. Visit www.rifishing.com, the Rhode Island Party & Charter Boat Association web site for a list of qualified charter captain members. Express your thoughts and concerns about fisheries management and select species 2013 commercial regulations at the December 3, 2012 Rhode Island Marine Fisheries Council meeting at Corless Auditorium, University of RI Bay Campus, South Ferry Road, Narragansett. The meeting starts at 6:00 p.m., agenda items will include Advisory Panel reports, the results of the November 8 public hearing and the Council will likely be voting on 2013 commercial fishing regulation recommendations for summer flounder, scup, black sea bass and Atlantic Herring. Visit www.dem.ri.gov for information and proposed regulation options. The United Fly Tyers of RI (UFTRI) will hold their annual Christmas banquet on December 5, at 6:30 p.m., Knights of Columbus hall on Sandy Lane in Warwick, RI. The event will feature a meal, a guest speaker and raffle. UFTRI is an educational organization, dedicated to teaching fresh and salt water fly tying. Yearly membership dues are $30. Tying vises and materials are available for use by guests (anyone attending for the first time), as well as any paid member. Visit www.uftri.org for information. Largest bass ever: Rhody Fly Rodders member Dave Pollack reached a milestone a few weeks ago by catching his largest bass yet on the fly, 42 inches and estimated at over 35 lbs. Rhody Fly Rodders meet every 3rd Tuesday of the month at the Riverside Sportsmen Association, East Providence. Tautog fishing still very good: Gil Barao (in photo) and his son Travis fished near the #2 red can off Newport in 58’ of water Saturday and landed eight tautog. 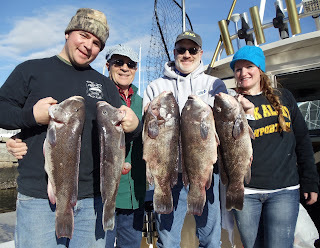 Fishing weather has been cold and breezy but those braving the weather are catching some nice tautog. It is Thanksgiving already. We have a lot to be thankful for in Rhode Island, we were clobbered by hurricane Sandy but did not experience the loss of life and property that New York and New Jersey experienced. By no means am I belittling our losses in Westerly, Misquamicut and along our southern coastal shores. Our residences suffered major losses and we need to continue to help them. Overall it was a good year for recreational fishing in our bays and ocean. Fishing this year was better than it has been in a number of years. The striped bass run in the Bay was moderate, however, the bass fishing continued to be great offshore around Block Island, the fluke season was good and we had an outstanding scup and black sea bass fishery this year. All this was capped with a surprisingly good fall tautog season that we are still experiencing. This is a lot to be thankful for. One species I am forever grateful for is Atlantic Menhaden as it serves as a food source for so many other fish including striped bass. If you fish RI coastal waters, offshore or in Narragansett Bay, now is the time to voice your concerns about this important fish species as the Atlantic States Marine Fisheries Commission’s (ASMFC) Atlanta Menhaden Management Board meets December 14, 2012 to consider regulations for this important species. In addition to being a primary food source for many other species of fish, menhaden serve as roving filters, converting algae into energy and thus reducing nutrient loads in bays and covers. 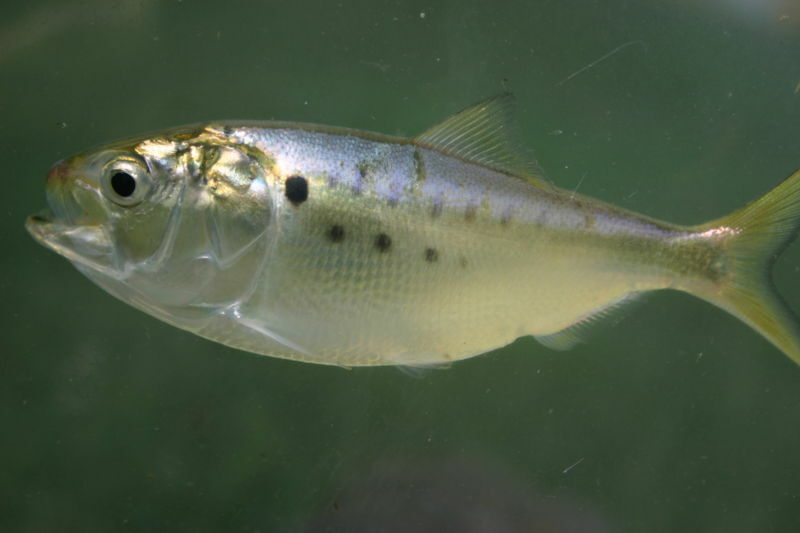 An adult menhaden, through its unique filtering gills, is able to process up to 4 gallons of water per minute or a million gallons of water every 180 days. Multiply this by the number of menhaden in any given area and this is an amazing amount of water being filtered, a reduction of nutrients means fewer algae blooms and ultimately more oxygen for all fish. The ASMFC’s Atlantic Menhaden Management Board will meet on December 14, 2012 in Baltimore, Maryland to consider approval of Amendment 2 to the Interstate Fishery Management Plan for Atlantic Menhaden. The meeting will take place at the Best Western Plus Hotel and Conference Center, Chesapeake Room, 5625 O’Donnell Street, Baltimore, Maryland. At the meeting, the Board will select the final measures to be included in the Amendment as well as an implementation timeline. Draft Amendment 2 was out for public comment until November 16, 2012. The Rhode Island Saltwater Anglers Association (RISAA) and other fishing groups in Rhode Island and Massachusetts expressed their thoughts on these important Atlantic Menhaden regulations at public hearings. However, even though the public comment period is officially closed it is important to continue to put pressure on the ASMFC committee to regulate on the side of the fish. To make sure this species is here to stay and will not continue to be overfished. Advocating for this species should continue through December as regulations are finalized and implemented. Watch this column for ways to advocate for this species as we get closer to the December meeting and beyond this meeting date. Amendment 2 presents a suite of options to manage and monitor the stock in both the short and long-term. These include options to end overfishing; change the biomass reference points to match the fishing mortality reference points; and establish a specification process to set and allocate total allowable catch (TAC), including procedures to close the fishery when a certain percentage of the TAC has been projected to be landed. It presents accountability measures to address quota transfers, rollovers, and overage payback, as well as options to allow for a specified amount of the TAC to be set aside for small scale fisheries and episodic events. To address monitoring and data collection needs, the Draft Amendment also presents options for timely quota monitoring and the collection of biological data through catch sampling. Overall it is a very comprehensive amendment. The Bureau of Ocean Energy Management (BOEM) held a workshop at the URI Bay campus Friday to discuss ocean windmills and their impact on fishing. This was the second of a series of eight workshops taking place on the east coasts to obtain input from commercial and recreational fishers. This input meeting addressed future potential conflicts between fishing and wind projects within the Ocean Continental Shelf (OCS). BOEM is seeking input from commercial and recreational fishing industries, as well as fisheries management agencies and scientists, relative to proposed offshore wind energy development. Some of the wind energy/fishing issues discussed included radar performance around wind farms (wind farms can a negative impact on radar), obstruction markings, the ability to shut down the wind farm for emergencies/rescues, exclusion zones, safety zones, electromagnetic fields (EMF) generated by turbines and their impact on fish, and financial compensation for equipment loss, liability damage, cable damage, etc. BOEM intends to process and summarize meeting input for consideration when formulating lease requirements for wind farms. Recreational anglers recommended such things as added underwater structure around turbine foundations to attract fish, a mooring ball system over the structure so anglers can tie up and fish, reflective markings on structures in addition to lights, radar reflectors, chart markings, mariner notifications during wind farm construction and some type of alert or warning system. For more information visit BOEM’s website at www.boem.gov. 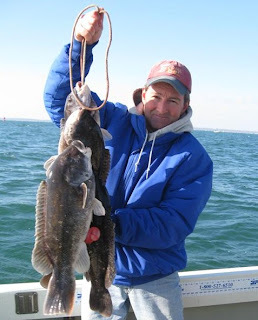 Family tautog fishing: Greg Vespe of Tiverton, RI took his family tautog fishing with Capt. BJ Silvia after hurricane Sandy. (From left to right) Shawn Hayes Costello (Tiverton, RI), Ric Vespe (Little Marsh, Pa), Greg Vespe, and Colleen Hayes Costello (Tiverton, RI). 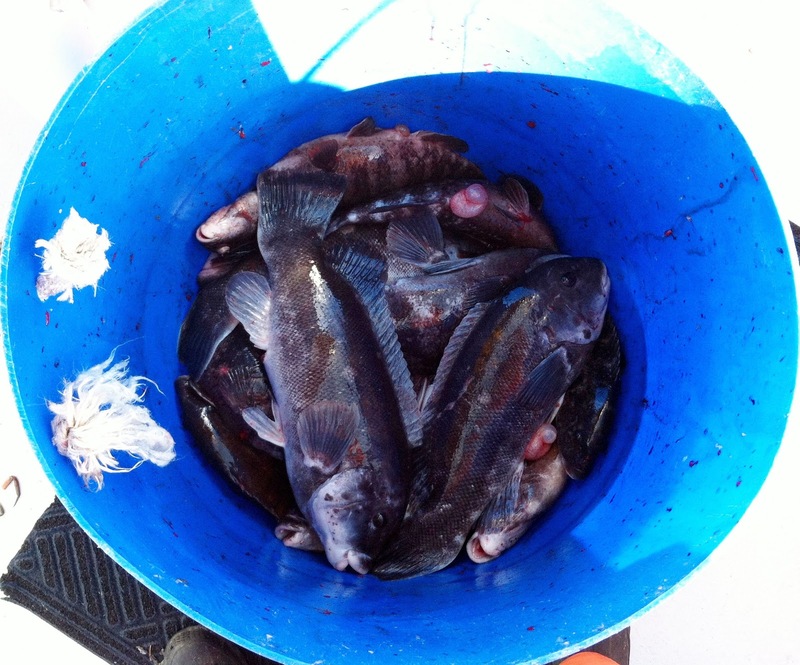 Tautog fishing is great: Chris Benn, mate on the Seven B’s party boat out of Point Judith, fillets my tautog catch Sunday. Some customers limited out, many anglers took home two to four fish and the largest fish that day was about nine pounds. Big bass migrating: Angler Kurt Rivard of Warren, RI landed this 35 pound striped bass last week drifting and eel in 30 feet of water near the Mount Hope Bridge. So you think it is all over. You think fishing is done for the season… hurricane Sandy and the nor’easter must have shut it down. Well… you are wrong… fresh and saltwater fishing is great. Anglers are catching bass and trout in ponds and rivers stocked by the Department of Environmental Management (visit www.dem.ri.gov for locations) and saltwater fishing is outstanding. Captain Rick Bellavance, president of the Rhode Island Party & Charter Boast Association said, “This is the best time of year to fish.” Anglers are catching tautog, cod, scup and striped bass. Black sea bass can still be caught recreationally in state waters (if you do not have a federal license). Since Sandy came though many anglers are limiting out with tautog (six fish per angler) and they are catching migrating striped bass too. Angler Kurt Rivard of Warren, RI landed a 35 pound striped bass last week drifting and eel in 30 feet of water near the Mount Hope Bridge. “The fish pulled 200 yards of line out before it got tired and turned” said Kurt’s fishing partner Corey Smith. 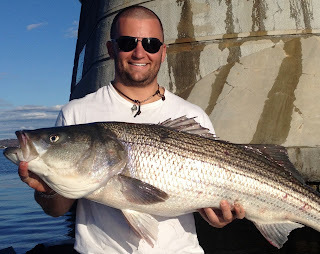 Five days after the hurricane, angler Greg Vespe fished for tautog. “I took my family out with Capt. BJ Silvia… we really clobbered them (tautog) on the near shore and mid shore humps off of Newport…lots of five and six pounders, five seven pounders and a nine pounder was tops for the day. Picked up at least 40 legal sized tog.” said Vespe. For anglers who may have put their boats away for the winter (and many did prior to the hurricane) there are a host of charter and party boats still fishing. Visit the RI Charter & Party Boat Association web site at www.rifishing.com for a list of boats, fishing times, rates and boat web sites for details. The smaller boats take two to six anglers and the larger party boats can take over a hundred anglers fishing. The Snappa from Point Judith is a custom 46’ fishing vessel. Captain Charlie Donilon, who has been fishing for tautog since Sandy, said, “We (have been) fishing south of Newport in the deeper water between 50 and 100 ft. The largest fish weighed (about) 14 lbs. Approximately 1/3 of the fish are throwbacks.” The Snappa has a heated cabin and will provide all bait and tackle. Your cost for an 8 1/2 hr. day of fishing is $130. A private group of six passengers can charter the boat for as little as $700. Additional passengers add $100/person. Visit www.snappacharters.com or call Capt. Donilon at 401-782-4040. The Seven B’s is 80 feet and is licensed to take up to 120 people fishing. They are tautog fishing now until December 15 at which time they generally switch to cod fishing. My brother-in-law and I fished with Captain Russ Benn this weekend, at first, the fishing was spotty but Captain Benn was determined to find fish and when he did all rods were bent. The crew was fantastic. Some anglers limited out and others caught two to four keepers. I did not speak to any unhappy customers. We fished out in front a mile or two off shore from Newport to the Sakonnet River. Seven B’s is now fishing Wednesday through Sunday, 6:00 a.m. to 4:00 p.m. Adults $85 and children $45. Visit them at www.sevenbs.com or call 401.789.9250. The Francis Fleet vessels are owned by Captain Frank Blount. He and his family have been running the business since 1978. They are running both tautog and cod fishing trips now. Visit them at www.francesfleet.com or call them at 800.662.2824. The second wind mitigation workshop for recreational and commercial fishers will be held November 16, 4:00 to 8:00 p.m. at the URI Bay Campus, South Ferry Road, Narragansett, RI. For more informationcall 978-465-0492. RSVP to Elizabeth Castle at ecastle@ene.com . The United Fly Tyers of RI (UFTRI) will hold their annual Christmas banquet December 5, at 6:30 p.m. at the Knights of Columbus hall on Sandy Lane in Warwick, RI. The event will feature a meal, a guest speaker and raffle. UFTRI is an educational organization, dedicated to teaching fresh and salt water fly tying. Yearly membership dues are $30 (September of current year through May of next year). Tying vises and materials are available for use by guests (anyone attending for the first time), as well as any paid member. Visit www.uftri.org for details and information. 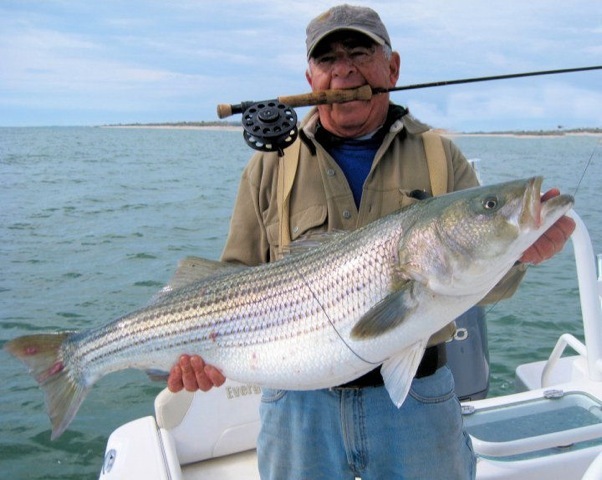 be presenting a slide program, “Sight-Fishing for Striped Bass”, a comprehensive overview on an exciting style of fishing for taking stripers in the clear shallows, including strategy, stealth, presentation and flies. The presentation will include information for everyone from beginners to seasoned anglers. Monthly Bucket Raffles with some great items will be held and as usual, the coffee pot is always on, along with a few tasty snacks. For information call Peter Nilsen, board member, at 401.245.7172 or e-mail him at pdfish@fullchannel.net . Directions: From Providence take Rt.195 to Exit 7. Bear right on the ramp & follow Rt. 114 South (Wampanoag Trail) for two miles. Look for WPRO Studios on left, and then take first U-turn back to Rt.114 North. Continue North and look for the Riverside Sportsmen’s Club sign on right side. Bay and along southern Coastal shores. Neil Hayes of Quaker Lane Outfitters, North Kingstown, RI weighed in a 58.45 pound bass that Nick Gibbs caught while fishing at night off the Narragansett shore last week. Nick was using a black bomber lure. Tautog fishing remains strong in the lower Bay and off coastal shores with a slower bite mid Bay and North. I fished on the Seven B’s Sunday… some anglers caught two to four fish, some limited out and the top fish was about nine pounds. Anglers experiencing a strong bite at Kettlebottom off Jamestown, Newport in the Brenton Reef area, off Point Judith Light and off Narragansett on rock clusters. Cod fishing is starting to pick up. This past Sunday Captain Letourneau of On The Rocks Charters reported limiting out on Cod. Captain Letourneau said, “Started out front in Newport with a 24" cod and never looked back…” The Francis Fleet repots an improved cod bite compared to this past week with the top fish Sunday weighing in at about 10 pounds.